I LOVE this bench. Came packaged well. Easy to put the legs on. Very solidly built. Beautiful! 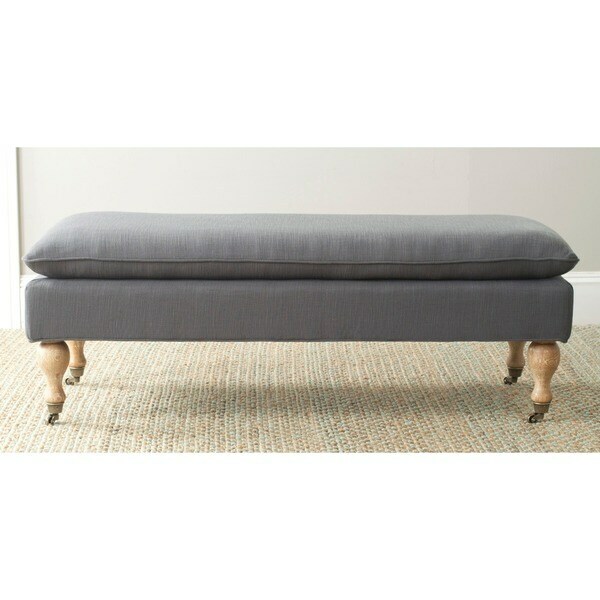 Our classic bench features proper turned English legs with solid brass casters and smart and neat knife edge seat cushion. All in a grey colored cotton blend fabric and is perfect for any home at the foot of almost any bed or in front of your coffee table for extra seating. Leg on bench broke after less than 6 months. It looks nice, but is poor quality. One of the legs on this won't stay straight up, causing the bench to lay crooked. Contacted Overstock, but since we didn't purchase the warranty, they won't replace it (even though it has been such a short time). We just use it for decor at the foot of our bed, and it is rarely used. I am about 107 lbs and occasionally use it to put on my shoes and socks. I am waiting to hear from someone to see if they will just even replace the broken leg. Very frustrating. With a plush mattress and large bed frame, this bench is much too low. I'm now looking for longer legs to replace the ones that came with the bench. Also, it attracts dog hair like crazy! I have to use a lint roller every other day. "what type of filling is used in the pillow top? is it soft or firm?" The bench has a foam seat cushion that is medium firm.